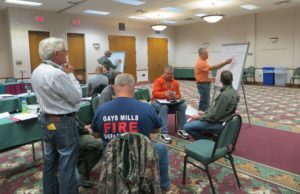 The first of three sessions was held for Wisconsin’s Community Tree Management Institute (CTMI). Twenty-six students from across the state met in Green Lake, WI October 17-18. 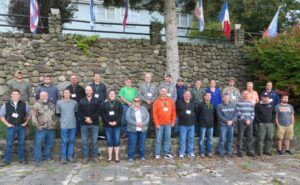 These municipal tree managers (who lack technical and program management in arboriculture) learned the foundations of urban forestry. Through hands-on training and exercises, students learned about: canopy and measurement tools, tree benefits, awareness and support, politics and policy, leadership, partnerships, legal issues, ordinances, budgeting, tree boards and utilities. Instructors for session I included: municipal foresters, public works directors, a UW Extension agent, utility representatives, consultants and DNR staff. The variety of instructors, their perspectives and interactive components is meant to appeal to all learning styles. The second and third sessions of CTMI will be held February 6-7, 2018 in Green Lake and June 19-20, 2018 in Stevens Point. Topics get more technical as the class progresses, until the last day when students take a tour and observe first-hand how one community puts it all together. An applied student project is included as a requirement of participation. Twenty-six urban forestry projects will be completed in communities all across our state, which may never have occurred otherwise. 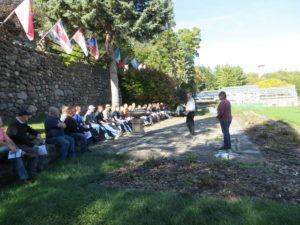 The retreat-like setting created by the small class size, interactive learning curriculum, and the facilities at Green Lake Conference Center only reinforced the focus on support-network development with other students, staff and instructors. To demonstrate the effectiveness of CTMI, DNR staff partnered with Dr. Rich Hauer and the University of Stevens Point. Three past CTMI classes were evaluated (2010, 2012 and 2015) with each class of 20 to 30 professional students trained over a 40-hour time-period. We found a significant increase in knowledge during each class and also for all content areas. The knowledge increase ranged from 1.38-1.82 (on the six point scale) for the three CTMI classes. Working to create and host such a successful CMTI is no small feat. We’re looking forward to an even more successful February and June! For more information contact Olivia Witthun (Olivia.Witthun@Wisconsin.gov), Urban Forestry Coordinator.